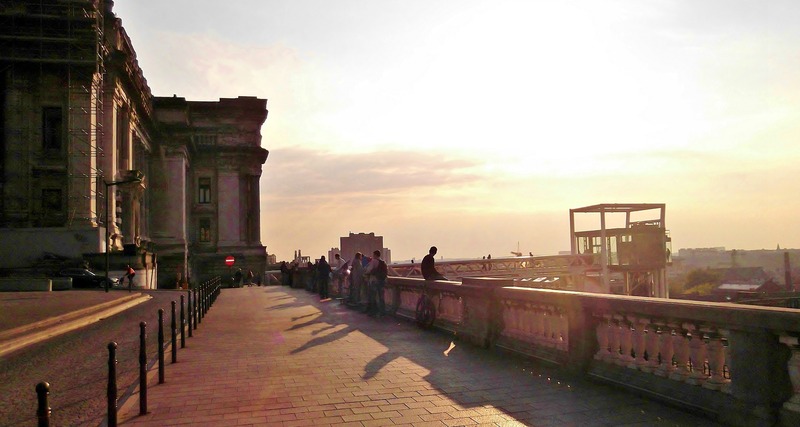 Happy in Brussels – One day in the capital of Belgium. Recently, I had the opportunity to spend one day in Brussels, the capital of Belgium. In my mind, there was always this idea of Brussels as the little sister of Paris, and I was wondering if it’s worth visiting. And judging by its appearance, Brussels actually IS Paris’ little sister. And this makes sense: In the middle of the 19th century, then King Leopold II along with Mayor Jules Anspach decided to tackle an ambitious endeavor: the urban restructuring of Brussels. At the time, Belgium hadn’t been an independent country for long and a new urban planning was supposed to turn the city into a prestigious capital. 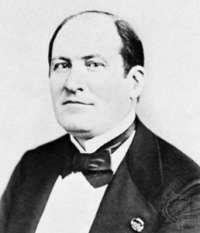 Anspach had been a great admirer of Baron Haussmann, the man who carried out the massive modernization program of Paris between 1853 and 1870. Paris as we know it today is mostly due to him: star-shaped spaces, wide straight boulevards connecting the most famous public monuments, magnificent buildings with homogenous facades and public parks. Nothing short of this was the urban vision for Brussels, and this is what you see when strolling around this charming city. But there’s a significant difference between Brussels and Paris: Brussels is small, or rather downtown Brussels is small. While there is no real “downtown” Paris (it consists of lots of different quarters, each of them a city in itself), downtown Brussels is exactly the right size for exploring it on foot. Most attractions are within walking distance. 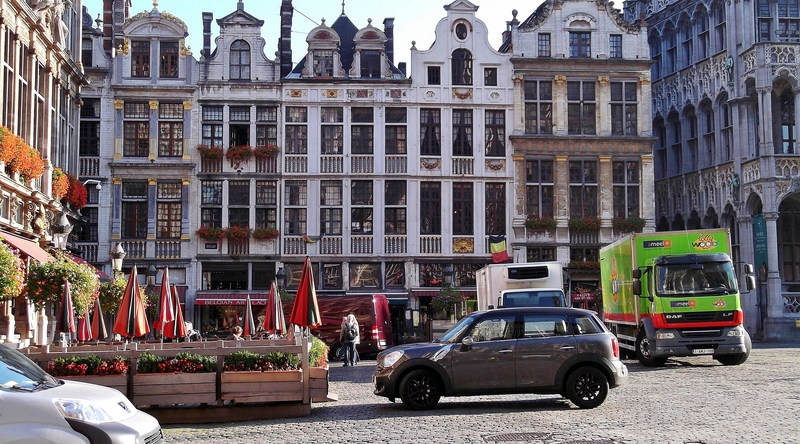 As I had only one day to visit Brussels, I opted to focus on the historic inner city, which is surrounded by a ring of wide boulevards called the “Inner Ring”. This area is also refered to as “The Pentagon”. It is framed by the Boulevard d’Anvers and the Boulevard du Jardin Botanique in the north, Boulevard du Régent and Boulevard de Waterloo in the east, Boulevard du Midi and Boulevard Barthélémy-Laan in the south-west. It’s the area where most touristic sights are situated. Grand’ Place is the central square of Brussels. Due to its beauty and uniqueness, it became a UNESCO World Heritage Site in 1988. It is also the birthplace of Brussels itself. In the 10th century, Charles Duke of Lower Lorraine constructed a fort on this site, which was the seed of what would become Brussels. 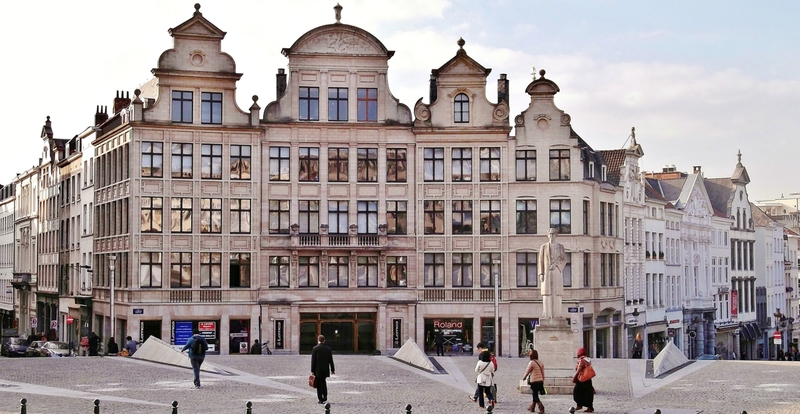 The square is surrounded by historical buildings which were erected in different architectural epochs: Brussels’ City Hall, the so-called Maison du Roi, and the Guild Houses. It was almost impossible to take any decent photographs without rows of cars in front of it. However, the beauty of this place was amazing. I was lucky with the weather, so the buildings were sunlit. Each of the houses looks different, with elaborate ornamentation on its facade. It was built between 1402 and 1455 in the so-called “Brabantine Gothic Style”, which is a variant of Gothic Architecture that is typical for the Low Countries. But what struck me the most was this abundant decoration. The whole building is covered with statues and ornament that looks like pinnacles. But one has to know that most of the decoration are reproductions. In 1695, Brussels was heavily bombarded by French troops. It is said to have been the most destructive event in the entire history of Brussels. Half of the City was destroyed, including the Grand’ Place. Only the City Hall’s belfry and some walls remained standing. After the destruction of the Grand’ Place in 1695 by the French canons, the rich Guilds of Brussels helped out and built new houses around the square which they used as meeting places. So each of the Guild Houses has still got a name that refers to its builders. Most of them were built in the fashionable style of the time : Baroque. It was built at the end of the 19th century in a Neo-Gothic style. Although it is named “King’s House”, no king ever lived there. It used to be a courthouse in the Middle Ages, now it is home to the City Museum. It’s located opposite the City Hall. 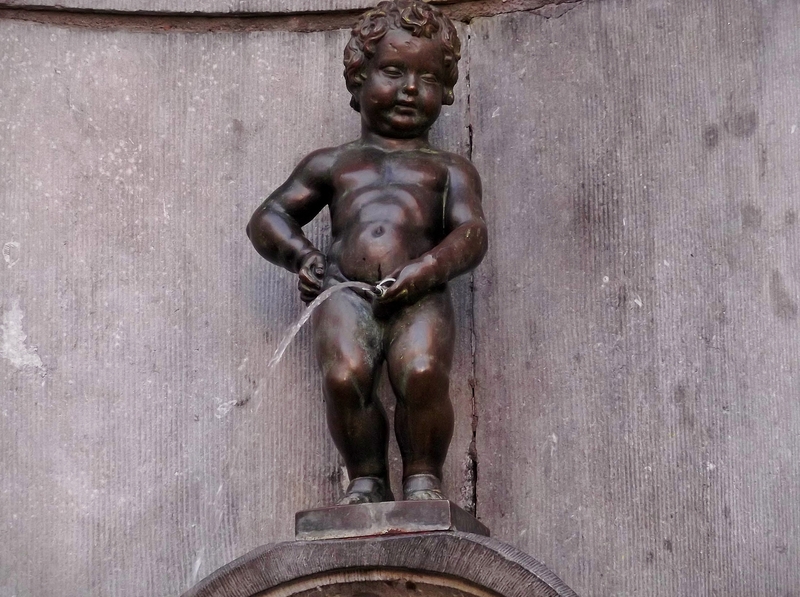 As far as I know, there isn’t any other city in the world which most known landmark is a peeing little boy. So here he is: A statue on a fountain, he’s standing so inconspicuous at a corner that I almost overlooked him. There are several legends behind this statue, but the most famous is the one about Duke Godfrey III of Leuven. In 1142, the troops of this two-year-old lord were battling against the troops of the Berthouts, the lords of Grimbergen. The troops put the infant lord in a basket and hung the basket in a tree to encourage them. 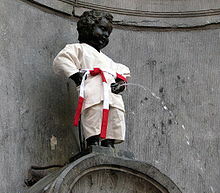 From there, the boy urinated on the troops of the Berthouts, who eventually lost the battle (Wikipedia). The funny thing about this statue is that he’s got a lot of costumes, in which he is dressed several times a week. Many of the costumes are displayed in the City Museum. It has become a tradition for foreign state guests to bring a new costume as a present. Oh my God – he is naked!! You’ll find him – with or without clothes – in every souvenir shop. The quarter Ilôt Sacré is the medieval Old Town of Brussels. Along with the Grand’ Place, it’s the site where Brussels was originally founded in 979. Brussels used to be on a little river, the Senne. But during the urban restructuring of the city in the middle of the 19th century (see above), the Senne was almost completely covered in order to have more open space for wide boulevards and large squares. And so the Ilôt was no island anymore. But the quarter’s medieval appearance didn’t change. It consists of lovely narrow, cobblestoned alleys where lots of souvenir shops and restaurants are located. Brussels is famous for its chocolates, mussels and French Fries. If you want to indulge in all that, you’ll find it here. But before you opt for a place to eat, I would do a thorough research on the internet. Ilôt Sacré is lovely as a whole, but some restaurants seemed like tourist traps to me. I was there quite early in the morning, so I could enjoy this place without the usual tourist crush. The Galeries St. Hubert is a covered shopping arcade that reminds one immediately of other classic galleries as in Milan. But I didn’t know that this one is even older. It was inaugurated in 1847, and was the longest and highest gallery at the time. Today, it is home to elegant and expensive stores and cafés. It is great to look at and I enjoyed the window shopping. I had planned to have a coffee sitting outside in the gallery, but it was rather drafty there (at the beginning of october). When you are in Brussels, there is one thing you shouldn’t miss: Brussels is stuffed with chocolate stores, which are called Confiseries. There you can buy delicious creamy chocolates that are a Belgian specialty. They will melt in your mouth and I can highly recommend them. All over Brussels, you’ll see the stores of the following brands: Leonidas, Neuhaus and Godiva. As to me, somewhere on the way I treated myself to some and then continued my wanderings. La Cathédrale des Saints Michel et Gudule is a Roman Catholic Church which was built between the 13th and 15th century. Its architectural style is Gothic and it is said to be the most beautiful church in Brussels, last but not least because of its beautiful stained-glass windows. However, if you have little time to visit Brussels, I’d say you can skip this one. Parc de Bruxelles is a wonderful place to have a rest. There are lots of benches under shady trees. It’s located between the Palais de la Nation, the official seat of the Belgian Parliament and Senate, and the Palais Royal, the official residence of the Belgian King. La Place Royale is a prestigious square in the style of Neo-Classicism (i.e. Klassizismus in German). It is surrounded by elegant buildings and the Catholic Church St.-Jacques-sur-Coudenberg which is neoclassical, too (built between 1776 – 1787). This Church used to have a temple-like appearance until, in the 19th century, someone had the genius idea of adding an incongruous bell-tower and a coloured fresco on the pediment (Fresco by Jean Portaels). And – with all due respect to this lovely city and its monuments – this is the most kitschy pediment decoration I’ve ever seen. This city is so mural-friendly (later more on that), why can’t someone come and lift them from this eyesore 😉 ? But the amazing René Magritte Museum, that is situated on Place Royale as well, made it all up to me. It is home to the world’s greatest collection of his works. Unfortunately, it is not allowed to take any photographs inside. This is the most beautiful café/restaurant I’ve ever been to. I like it even better than the Café Campana in Paris (on the 5th floor of the Musée d’Orsay), that has been my favorite before now. Admittedly, I’m an aficionado of Art Nouveau, so I was an easy touch. This is the Art Nouveau building where the Musical Instrument Museum is located (built in 1898/1899 by Paul Santenoy). It used to be a department store called ” Old England”. The café is on the 10th floor. I’ve written a whole post about this adorable cafe, see it here. 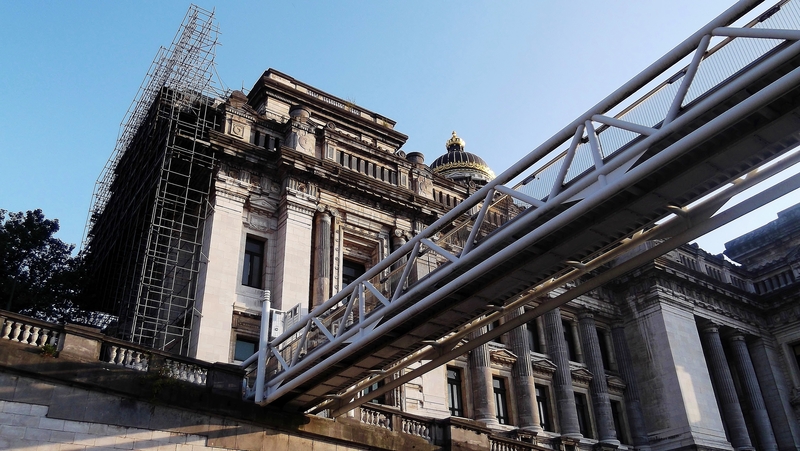 Brussels features not only innumerable museums, such as the famous Musées des Beaux Arts de Belgique and the Art Nouveau Musée Horta, it also seems to have a very friendly attitude towards public art. Actually, it’s one of the things that strikes you immediately when you walk the city. For example, there are a lot of murals. They seemed to blend in very well with the surroundings, and I didn’t have the impression that they were mainly considered as a kind of damage to property as it is in Germany. On the contrary, they were well-kept and an integral part of public life. 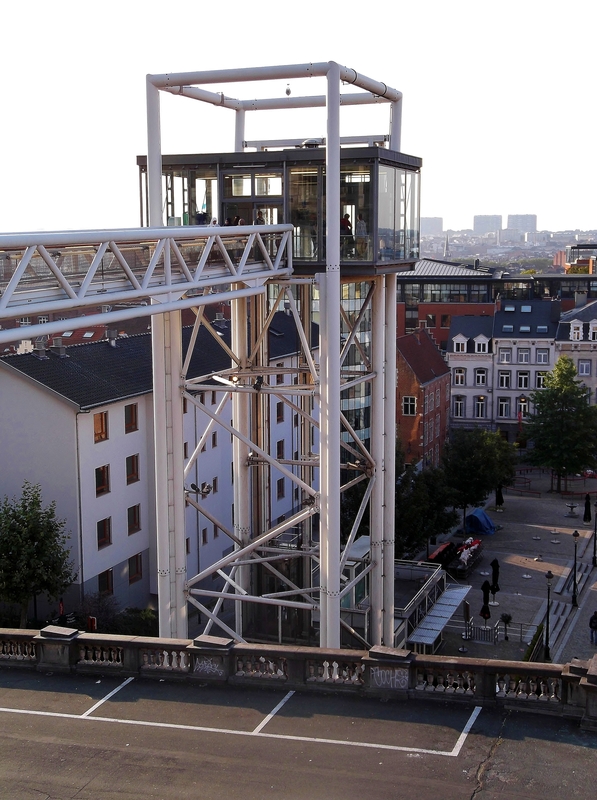 And Brussels is home to the only museum in Europe which is solely dedicated to comics, the Centre Belge de la Bande Dessinée. The Belgians are known to cherish comics as the “9th art”. This comes as no surprise, as two world-famous comic-strip artists are Belgians. The first is Hergé, who created “The Adventures of Tintin”, the second is known under the name of Peyo, who brought “The Schtroumpfs” into being, better known in Germany as “Die Schlümpfe” and in the English-speaking countries as “The Smurfs”. This brings us to the next item: Art Nouveau and Art Déco in Brussels. Brussels is so abundant of Art Nouveau and Art Déco buildings that you don’t know where to start. You see them almost everywhere, but especially in the residential areas of Ixelles and St. Gilles. 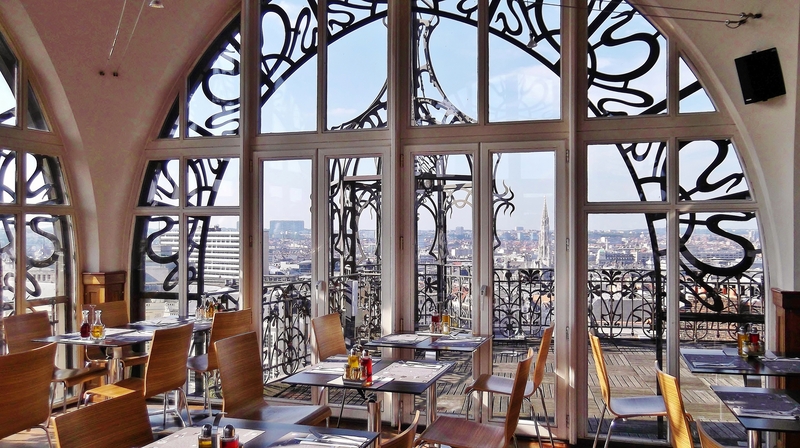 And because those quarters are situated outside of the historic city center, I decided to come back to Brussels in spring next year and dedicate a whole day only to exploring the Art Nouveau landmarks. As to the photograph above: When I sat on the marvelous terrace of the Musical Instrument Museum and looked down over Place Royale, I couldn’t believe my eyes: even the streetcars are stylishly decorated with Art Déco motifs! And this was my impression of Brussels as a whole: It seems as if an interior designer had carefully and tastefully created the whole city. Everything seemed to match: Beginning with a standard flower arrangement on Grand’ Place, up to eye-catching ornamental patterns on the buildings. Before this digression, where were we? We were on the breathtaking terrace of the Musical Instrument Museum. To say it bluntly, the term “mountain” is a little bit too bloated for what you have here: There are two flights of stairs leading down to the Place de l’Albertine. And it’s called an arty mountain because of some museums that are on both sides of the flights, as such the Musées Royaux des Beaux Arts de Belgique. However, you have a nice view of Brussels and a garden. From Place de l’Albertine, I continued on the Boulevard de l’Empereur. 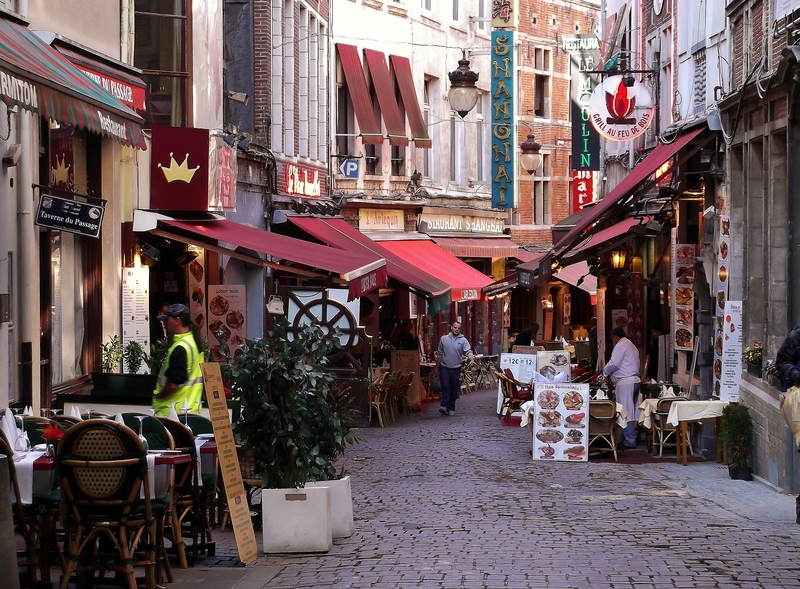 Then I turned left and found myself on a nice pedestrian alley with many restaurants, called Rollebeek. From there, I went straight on until I arrived at Place Grand Sablon. At the end of Grand Sablon, I headed in the direction of Le Palais de Justice on the Rue de la Régence. Finally I arrived at Place Poelaert. At first glance, Place Poelaert doesn’t exactly look attractive. You’ve got a wonderful view of Brussels. I was especially lucky, because it was the beginning of sunset when I arrived. And when you look to the left, you’ll see the monumental Palais de Justice. It is the most important Court building in Belgium. It was built between 1866 and 1883 in an eclectic style by architect Joseph Poelaert. At the time, it was the biggest building constructed in the 19th century. It still looks gigantic and over-the-top, a chunk of a building. This is the result of urban megalomania, of which some present-day architects equally seem to suffer. There is another thing you have to know about Brussels: Brussels is set on a hillside, and therefore there are an upper and a lower part of the city. If you want to go from below to the top or vice versa, you’ll use either roads or stairs. 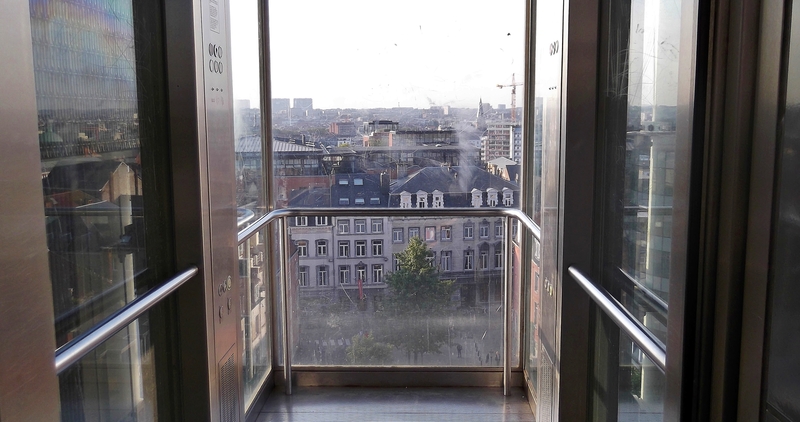 This is “L’Ascenseur des Marolles” (Elevator of the Marolles Neighborhood). 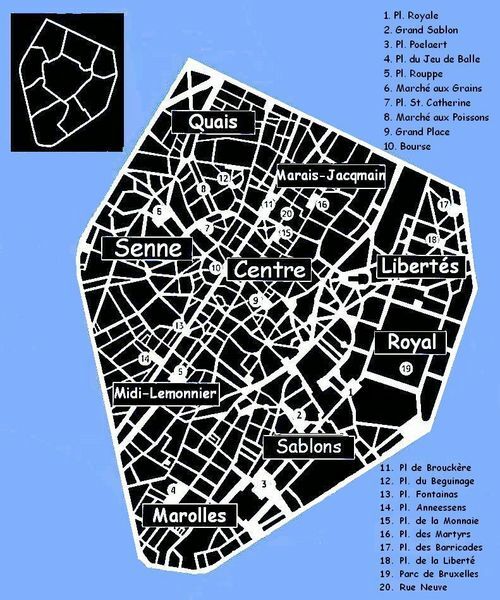 It connects the upper city with the Breughel l’Ancien square in the Marolles quarter. When I did some research on the internet, I was surprised how many cities use an elevator for urban transport (see entry elevator in Wikipedia, you have to scroll down at the bottom of the page). I must say, I was quite fascinated by this construction. And naturally, I wanted to ride it. But as a person that is afraid of heights, this was a difficult endeavor for me. Actually, I already felt so dizzy when I was walking over the gangway, so that I stood completely paralyzed in front of this cubicle for about 10 minutes. Once safe and sound on the site below, you’re in the Marolles Neighborhood. My day-trip came to an end here, and I strolled through this ancient working-class district until I arrived at Gare du Midi, the Brussels-South railway station. At this point, I had been walking for almost 11 hours, with two short breaks at restaurants. I realized that this had been a really tough program. So in case you don’t want to feel completely exhausted at the end of the day, I would advise to shorten the must-see list. But from my point of view, it was worth every minute of it. And just one last remark: Some of you might wonder why I didn’t include the so-called Atomium in my list. 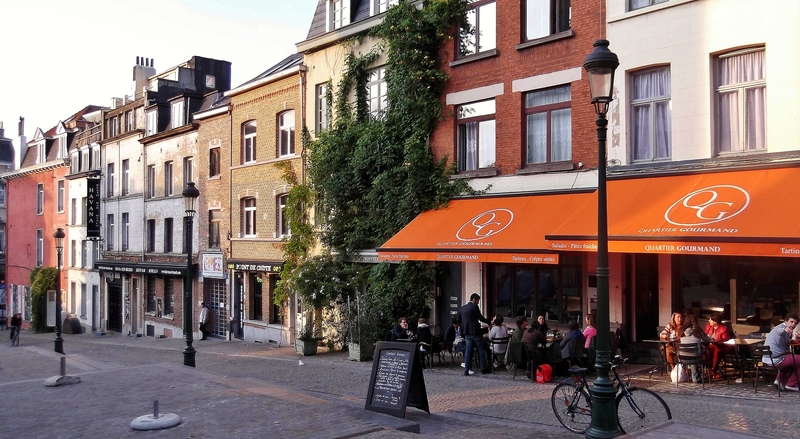 As it is located in the suburb neighborhood of Laeken, it would have taken up too much time to go there. Then, it seemed to me like a very touristy attraction, and I wasn’t sure if it’s really worthwhile. So this one has to wait until next time around. Would you like to follow KleesButterfly on other social media sites? I’d be happy to meet you there! Five days in Berlin, Germany, Part 2: Fun with Squares. Five days in Berlin, Germany. Part 1: A cruise on the river Spree. 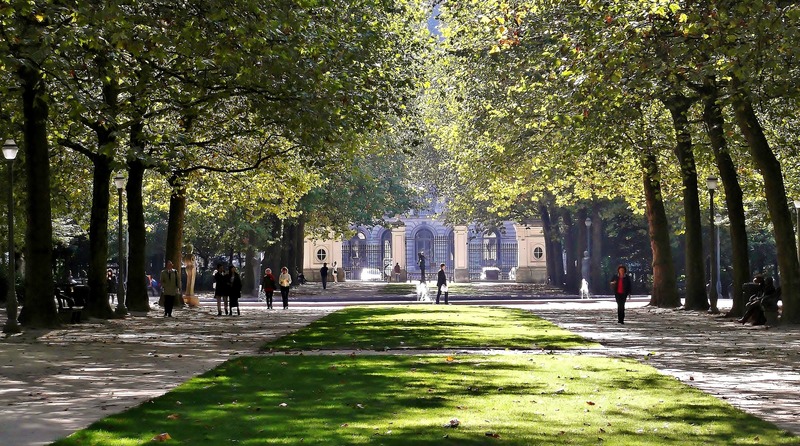 Your virtual tour has out Brussels right up on my Must visit List. Unfortunately it is a long way from Australia! Thank you, I hoped that people can get an impression of this city. Maybe you can make it there sometime. Everything is quite close together in Europe and Brussels is perfect for a day trip. Very nice and thorough tour of Brussels. I was there earlier this year and really enjoyed it. Thanks, I really had a wonderful and sunny fall day there, too. Thank you for your insights. Working in Brussels for a month and learning how to fill my weekends alone. Brussels must be wonderful in June, have fun! [EN] I am heading to Brussels for a week in July and therefore I am so glad I found this Blog Entry by “KleesButterfly”. Although I have been to Brussels 2 times, most of the locations she shows I have not seen – perhaps this time!!! | [DE] Im Juli werde ich für eine Woche in Brüssel sein und deshalb bin ich so froh dass ich diesen Blog-Eintrag von “KleesButterfly” gefunden habe. Obwohl ich schon zweimal in Brüssel war, habe ich das meiste noch nicht gesehen – aber hoffentlich diesmal! Thank you so much for reblogging my post! I don’t know how I missed that cafe when I was there! Lovely blog. Thank you so much! I have realized that the café isn’t advertised that much. Maybe because it’s a museum’s café. But you should go there definitely next time you’re in Brussels. WOW! You managed to pack in a lot of fantastic photos and great information for a one day visit . . . . you are definitely giving me some good pointers and creative lessons on how to do a travel blog. Thanks!! Thanks you! I’m pretty aware that I was very lucky with the weather on this day. It has become my FAVORITE café of all times. I’m a huge fan of Art Nouveau, and this place was so lovely! Brussels is on my bucket list. I sure hope I make it because these photos are gorgeous. Thank you! Brussels is worth it, it’s an underrated travel destination. Great post. Lots and lots of information. Bruxelles definitely is a wonderful city. I have only been there twice for a day, but always loved it. Thank you, I really think Brussels is underrated as a travel destination! You won’t believe it, but I passed out on my train ride home and ended up in hospital. It turned out that I had drunk too little and walked too much. Not sure how you found my blog, but thanks for the follow as that gave me the opportunity to find you. And I can see why this is one of posts people like most (is that right?). For a one-day tour, you captivated years of history, and the every day. Your photos are excellent. I find this post a remarkable…what…thing. Hey is your theme a Premium? The layout is nice. I always take advantage of Friday’s Photo Challenge to look for new blogs that I like. Thanks for your back-follow 🙂 And my theme actually is a Premium theme called Traveler. I feel as if I’ve been to Brussels 🙂 What a comprehensive and beautifully photographed post. Many thanks for the follow. I’m honoured. Thank you again, this is really nice! Don’t mention it; the pleasure is all mine…always happy to share good work when I see it. You should, Brussels is so underrated as a travel destination. I was enthusiastic about it when I was there, it’s beautiful and has so much to offer! Your photos are just AMAZING! The pic of the restaurant of the musical instrument museum is my favourite – WOW. To date, I’ve only done day trips to Brussels, and I’ve discovered so many worthwhile sights that I didn’t find the time to enjoy pubs or restaurants properly. The only thing I won’t forget it the restaurant in the Musical Instruments Museum, which has become my all-time favorite cafe (as I am an Art Nouveau enthusiast). I’m planning to go to Brussels again, and I will take a look at your nice blog then. Very nice post… Thanks for sharing! Europa Coaches Brussels specializes in providing you with private tours within Brussels, Belgium or anywhere else in Europe. Spending one day in Brussels June 2016 en-route to Netherlands. This is the best background information to have and especially the section on the restaurant on top of the music museum. That location is a must do! Thank you so much for your brilliant day trip for me. Thank you, I’m happy that I could help 🙂 Hope you gonna have a nice day in Brussels!